Over the last few months, Elliotts Builders Merchant has been part of a community effort to build a specially adapted home for a Southampton child and his family. 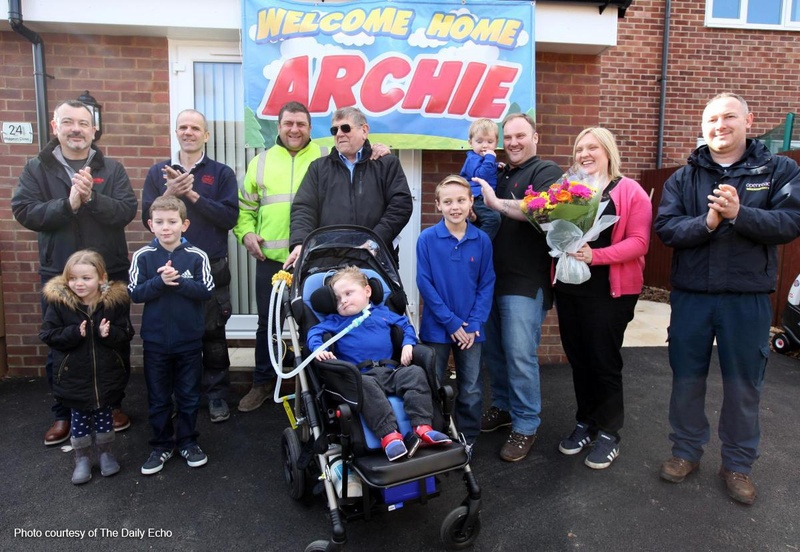 Toddler Archie Adams, who was struck down with a virus that left him paralysed from the neck down was given a surprise new specially built home after the Southampton community pulled together to raise funds for the build. Working together with other organisations and members of the community, Elliotts contributed funds and provided free and discounted materials for the converted three-bedroom house in Lordshill. During a visit to a park in 2015 the three-year-old contracted the virus transverse myelitis which caused him to become a paraplegic. The rare condition causes severe spinal damage resulting in the young Saints fan undergoing months of treatment and rehabilitation. It has meant Archie’s parents, Karen and Russell, have been forced to camp out at Southampton General Hospital for a year and a half for Archie’s treatment, followed by a further 6 month stay at The Children’s Trust in Surrey. The devastated couple had always hoped they could bring him home one day but needed to raise £50,000 to fund a specially made house, suitable for Archie’s condition. Southampton City Council donated £30,000 via a development grant, while the rest of the money has come from fundraising initiatives and donations from various organizations and people in the community. Ed Butcher, Product Manager at Elliotts, said the 175-year-old family business was moved by Archie’s story. “We wanted to get involved and help Archie and his family,” he said. “We raised £3,500 through charity events and donated the kitchen and bathroom as well as various other materials needed to convert the house. The three-bedroom house conversion includes a brand new and extended kitchen and bathroom, an open-plan downstairs area and a ramp providing easy access from outside the front of the house. Chief fundraiser and project manager Ian Meyer said the response from the community has been incredible. “I heard about what happened to Archie and wanted to support him and his family in any way I could,” he said. Elliotts Builders Merchants, Wickborne Homes, Melvine Reliance Engineers, Southampton Grab Hire, Dan Cousins, Darren Attwood, New Forest Hire, Rentool Southampton, Chris Creighton (Scaffolding), Debbie and Anita (DHG Partnership), Nigel Gunner (structural engineer), SGN for installing new gas line, Maria, Judith and Jason, Nigel and Amy Spencer (gas suppliers), Rebecca and Jo (Environmental Services), KR Heating and Plumbing Engineer, Ken Pothacary and Gavin (free broadband and caller display free for a year), Lee Brogan Williams Plumbing, Dave Summers (Solent Blinds).